Perhaps America does not need Russia to "hack its democracy" and destroy "American exceptionalism", perhaps the US is perfectly capable of unleashing social, economic and political devastation within its border without anyone's help; perhaps the surge in mass shootings has little to do with gun availability (see homicides in Chicago and Baltimore where guns are banned), and everything to do with a creeping US social decay? Read the following troubling observations from the latest Weekend Notes by One River CIO Eric Peters, and decide. 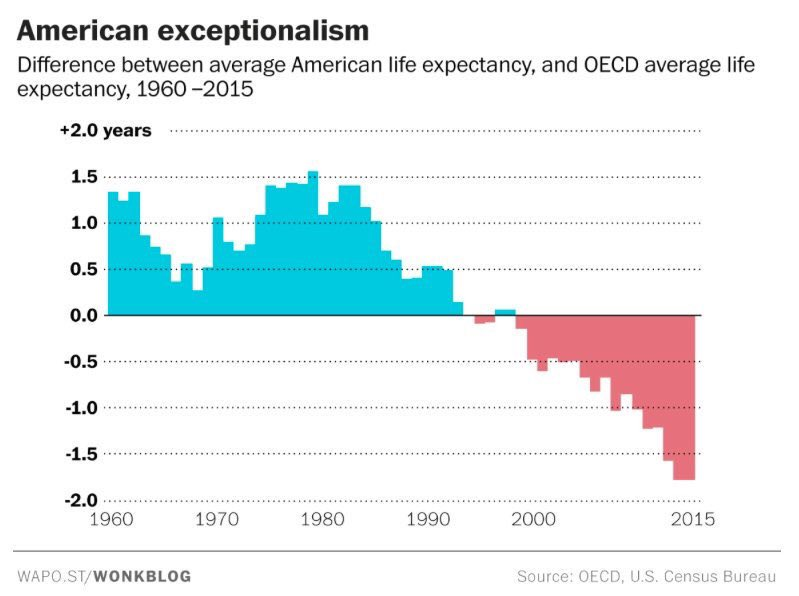 US life spans have declined for 2yrs, a feat without parallel in the developed world. Opioids are largely responsible. An estimated 52k will die of overdoses in 2018, half a million Americans in the coming decade (about the same as WWI and WWII combined). We consume 99% of the world’s hydrocodone and 81% of its oxycodone. We use an estimated 30x more opioids than is medically necessary for a population our size. 75% of opioid addicts began with prescription painkillers given to them by a friend, family member, or dealer. The US has 5% of the world’s population, 48% of the globe’s civilian-owned guns, and 31% of earth’s mass-shooters. Americans own 89 guns per 100 people (nearly 300mm firearms). Yemen, engulfed in a 3yr civil war, has the planet’s next highest rate of gun ownership at 55 per 100. US gun homicide rates are 25x higher than other high-income countries. 66% of American gun owners possess firearms to protect themselves. We’re a nation known for our imagination, yet 75% of gun owners can’t imagine not owning one. China produces 49% of the world’s steel, followed by Japan (6.2%), India (6.0%), and the US (4.8%). South Korea and Russia are tied at 4.2%. The EU collectively produces 10%. But of these producers, only one is a net steel importer: USA. In the aftermath of WWII, the US produced 72% of the world’s steel. Production continued to grow as the world overtook us. America’s peak production was in 1973 (140mm metric tons). We now produce just 81mm. China produces 832mm. And we’re about to impose 24%-56% import tariffs. The US ranks 24th out of 35 developed countries in math, science and reading skills among 15-year-olds. We rank 20th in adult literacy and math skills. 2.1% of workers with college degrees are unemployed and their labor force participation rate is 73.4%. For those with some college education, unemployment is 3.4%, and the participation rate is 66.0%. For a high school diploma, unemployment is 4.5%, participation is 57.5%. And some high school education, unemployment is 5.4%, participation is 44.8 – too many of the remaining 55.2% are addicted to opioids, commit gun violence, and would be working in steel mills if only we rebuilt them. Opium, heroin, morphine, and a universe of synthetic opioids, including the superpowerful painkiller fentanyl, are its proliferating offspring. More than 2 million Americans are now hooked on some kind of opioid, and drug overdoses — from heroin and fentanyl in particular — claimed more American lives last year than were lost in the entire Vietnam War. Overdose deaths are higher than in the peak year of AIDS and far higher than fatalities from car crashes. The poppy, through its many offshoots, has now been responsible for a decline in life spans in America for two years in a row, a decline that isn’t happening in any other developed nation. According to the best estimates, opioids will kill another 52,000 Americans this year alone — and up to half a million in the next decade. We look at this number and have become almost numb to it. But of all the many social indicators flashing red in contemporary America, this is surely the brightest. Most of the ways we come to terms with this wave of mass death — by casting the pharmaceutical companies as the villains, or doctors as enablers, or blaming the Obama or Trump administrations or our policies of drug prohibition or our own collapse in morality and self-control or the economic stress the country is enduring — miss a deeper American story. It is a story of pain and the search for an end to it. It is a story of how the most ancient painkiller known to humanity has emerged to numb the agonies of the world’s most highly evolved liberal democracy. Just as LSD helps explain the 1960s, cocaine the 1980s, and crack the 1990s, so opium defines this new era. I say era, because this trend will, in all probability, last a very long time.